Davis Dam and Powerplant facility was constructed by the Bureau of Reclamation in Pyramid Canyon, 67 miles downstream from Hoover Dam. The site is about 10 miles north of the point where Arizona, Nevada, and California meet and approximately 2 miles upstream from the Laughlin, Nevada, and Bullhead City, Arizona, communities. Reclamation had investigated a possible dam site in Pyramid Canyon as early as 1902-03, but until Hoover Dam controlled the Colorado River, a dam at the Davis site was not considered practicable. In 1930, as the Hoover Dam project was moving forward, Reclamation made further investigations and explorations of the site which led to the authorization of the Davis Dam Project. Photo - Davis Dam spillway.The Davis Dam Project was authorized April 26, 1941, and a contract for the construction of the dam and its associated structures was awarded in June 1942. However, work was halted after the War Production Board revoked priority ratings needed to obtain the necessary materials for construction. Work resumed in 1946, and the dam and powerplant were completed in 1953. Davis Dam is an earth and rock-fill embankment with a concrete spillway, gravity structure, intake structure and powerplant. Behind the dam lies Lake Mohave which is confined for most of its length between the steep walls of Pyramid, Painted, Eldorado and Black Canyons. The lake is comparatively narrow, not more than 4 miles across at its widest point. The primary purpose of Davis Dam is to re-regulate Hoover Dam releases to meet downstream needs including the annual delivery of 1.5 million acre-feet of water to Mexico. This is in accordance with the 1944 water treaty with Mexico. Lake Mohave also provides recreation and habitat for fish and wildlife. Additionally, the lake captures and delays the discharge of flash floods from side washes below Hoover Dam. 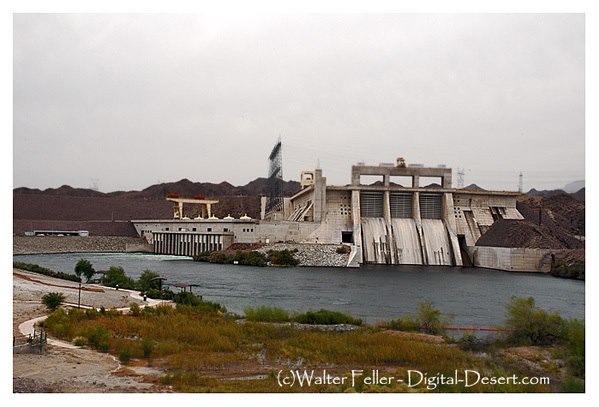 Located on the Arizona side of the river, the Davis Dam Powerplant is immediately downstream from the dam embankment. The forebay is formed by the intake, spillway and gravity structures. The powerplant adds substantially to the Colorado River hydroelectric energy pool by generating 1 to 2 billion kilowatt-hours annually. This energy is used in the Southwest to turn the wheels of industry and pump water from wells to irrigate farmlands and water livestock. The Davis Dam and Powerplant facility was constructed at the cost of approximately $67 million, which was repaid from power revenues. Contributions also came from the Federal Highway Administration and the State of Arizona for bridge and highway construction. Davis Dam is part of the Lower Colorado Dams Area Office, headquartered at Hoover Dam. The project also includes Parker Dam. Hoover, Davis and Parker Dams are operated integrally to control floods along the river and furnish hydroelectric energy through interconnections with Western Area Power Administration power systems. Photo - View of generator shafts at Davis Dam.The Davis Dam Powerplant is linked with a federal power distribution system operated by the Western Area Power Administration. The total system consists of 2100 miles of high-voltage transmission lines serving 43 power substations in Arizona, Nevada, and California which supplies power to a number of utilities and other entities in this area. Lake Mohave, behind Davis Dam, is part of Lake Mead National Recreation Area administered by the National Park Service. The area around the lake and along the Colorado River below Davis Dam provides a multitude of recreational opportunities, including fishing, boating, swimming, water skiing, camping, picnicking, exploring, photography and just plain relaxing. Facilities for public use are located at Katherine's Landing in Arizona near Davis Dam and at Cottonwood Cove east of Searchlight, Nevada. Public campgrounds are available at these locations where concessionaires provide trailer parks, restaurants, lodging, docking facilities, boat and fishing tackle equipment, and fishing licenses. A fishing license from either Arizona or Nevada to which a special-use stamp from the opposite state is attached, is required for those wishing to fish on Lake Mead or Lake Mohave. Rainbow trout are found in the cool, clear water at the upper end of Lake Mohave, while largemouth and striped bass can be taken from the lower reaches of the lake. SELF GUIDED TOURS ARE NO LONGER AVAILABLE at Davis Dam. THE ROADWAY OVER DAVIS DAM IS CLOSED TO PUBLIC TRAFFIC. As of April 2004, the roadway across the dam is closed to all vehicles; pedestrian and bicycle access to the dam is still allowed.